NOTE: 7 night trip (8 days including travel time) Divers and non-divers welcome! It also ranked #2 for Best Overall Destination and Best Marine Environment. 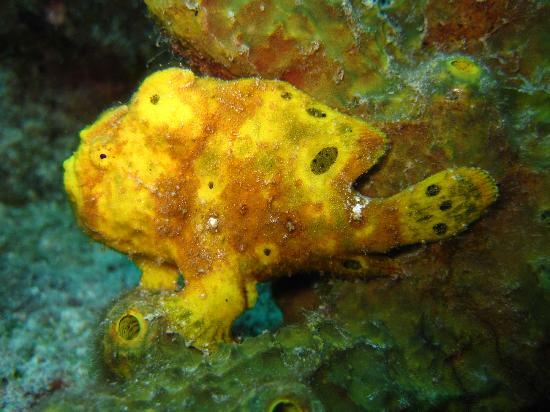 Bonaire is also ranked #3 for Best Overall Diving and #4 for Best Visibility. Professional photographer and Course Director, Barbara Gentile-Crary will be on hand offering underwater photo consultation and image critiques to help improve your underwater photos. Divers will also have the option of adding more boat dive trips each day to explore more of the remote sites (at an additional cost). You will experience Bonaire and Buddy Dive Resort with us. An unhurried, unspoiled natural paradise offering spectacular sunsets, gentle breezes and crystal clear, turquoise waters. Buddy's is a resort where you can DIVE DIVE DIVE, take part in a multitude of activities or just sit back, relax and enjoy the atmosphere. At Buddy Dive, their casual atmosphere, personable staff, spacious accommodations and a dive operation that has something for every diver: comfortable boats, complete rental and retail center, exceptional staff, and a unique "Drive Thru" with a two-lane air/Nitrox fill station. No matter which apartment you are staying in, you're never further than a giant stride away from our popular and lively house reef which is perfect for diving and snorkeling, day and night. Welcome drink, "Manager's Run Punch Party"
International/Domestic Round-trip Airfare. Group airfare maybe available. TRIP PAYMENT DEADLINES - has passed, full payment is due upfront to guarantee space. 7 night land-based dive package $1250 per person, double occupancy includes resort and diving. Please contact us for the discounted rate for non-divers and for the price to upgrade. Delta Airlines offers a weekly Saturday non-stop flight from Atlanta to Bonaire and return. RECOMMENDED! United Airlines offers several non-stop weekly flights from both Houston and Newark, and all flights should be considered seasonal. This means that during periods of low demand, the airline may decide to withhold services until such time as demand is higher. There can be additional flights added to their schedule during times of peak demand. For more information about the schedule from both Newark and Houston, visit the United web site. Insel Air operates a weekly rotation from Miami to Bonaire with a change of planes in Curacao. For reservations on Insel Air, travelers from the United States should call toll free 1-800-386-4800, or consult their professional travel counselor. More information on Insel Air can be obtained at http://www.fly-inselair.com or by contacting the Insel Air call center on Curacao at + 5999-737-0444. To reach the Insel Air offices on Bonaire at the airport, call 717-2004/2008, 786-6750, or 785-3076. Their office at Flamingo Airport is open from 7:00 AM to 8:00 PM daily. ** If you need assistance, we can help you with arrangements through PADI Travel. Note: you are responsible for you own air transportation and to and from LAX. The Malibu Divers trip begins and ends at Bonaire. Passport must be valid for at least 6 months beyond your expected trip return date. Trip Release of Liability Waiver Requirement: Every registered guest will receive a Trip Waiver that must be completed prior to the trip. Dive Accident Insurance: Every diver on this trip is required to have Diver Accident Insurance coverage for an out-of-country accident including medical flight evacuation costs through Divers Alert Network or other dive accident insurance agency. Trip Insurance: We strongly recommended that you purchase additional trip cancellation and interruption coverage to help defray costs arising from unforeseen events. No one plans on an emergency, but you can prepare for one. Carefully read any insurance policy before purchase to make sure it covers your specific needs. There are several companies that offer travel insurance. Terms: Malibu Divers act only as an organizer and expeditor of this trip for the sole purpose of offering a service to its clients. We do not sell diver accident insurance or trip cancellation and interruption insurance. We are giving you information about insurance coverage as a service only. We are not a licensed travel agency. We solicit the assistance of licensed and reputable travel and insurance agents to assist us on your behalf. • If you must cancel, the deposit is non-refundable. Incremental payments are non-refundable unless we are able to fill your vacated space at the full purchase price. • If we are unable to fill your spot on the trip, all incremental money paid toward the trip will be forfeited. • Should you fail to make incremental payments by the posted due dates, we reserve the right to cancel your reservation and sell your spot to another person. • No refunds of deposits made prior to non-payment of an incremental payment will be issued. Bonaire, a mostly volcanic island surrounded by a corral reef in the southern region of the Caribbean Sea, is consistently rated as one of the best places to visit and dive. It is part of the ABC islands of Aruba, Bonaire, and Curaçao and is special municipality within the country of the Netherlands. Also part of Bonaire and to the west of the main island is the uninhabited islet of Klein Bonaire. Official language is Dutch but English and Spanish is spoken everywhere, and the native language is Papiamentu which is mixture of Dutch, Spanish, French, English, Portuguese, African, etc. Buddy Dive Resort: Featuring 2 outdoor pools and an on-site dive shop, the Buddy Dive Resort is located right in front of a popular diving spot in Kralendijk. All accommodations have free Wi-Fi and sea views. Each air-conditioned studio and apartment at the Buddy Dive Resort features cable TV, a bathroom with a shower and a well-equipped kitchen. Apartments also have a living room. At Buddy Dive Resort, there is a poolside bar and 3 international restaurants. You can also find shops, restaurants and bars in central Kralendijk, a 10-minute drive away. Location: 30 miles (48 km) east from Curacao; 50 miles (80 km) north of Venezuela and 86 miles (129 km) east of Aruba, outside of the Caribbean hurricane belt. Size & Geography: 24 miles (39 km) long by 3-7 miles wide, 112 square miles (290 km2). Highest elevation is Brandaris Hill, 784 feet (240 meters). Climate: Yearly average temperature is 82°F (27.8°C); water temperature of 80°F (26.7°C); rainfall of 22 inches (56 cm) mostly during the night and in burst during the rainy season (November though January); humidity of 76%. Sunny, all year round. Windy side of the island is the east side. High season is usually December through April. Airport: Flamingo International Airport or Bonaire International Airport (IATA: BON, ICAO: TNCB) is an international airport located at Kralendijk, Bonaire, Netherlands. Airlines operating into and out of: Arke Fly, Continental Airlines, Delta Air Lines, Divi Divi Air, Dutch Antilles Express, Insel Air, KLM, Tiara Air. Bring your passport. Scuba Diving: Caribbean's best easy diving and more good shore dives than anywhere else. Rated #1 dive spot in the Caribbean Sea.Novice, Intermediate and Advanced levels of diving.